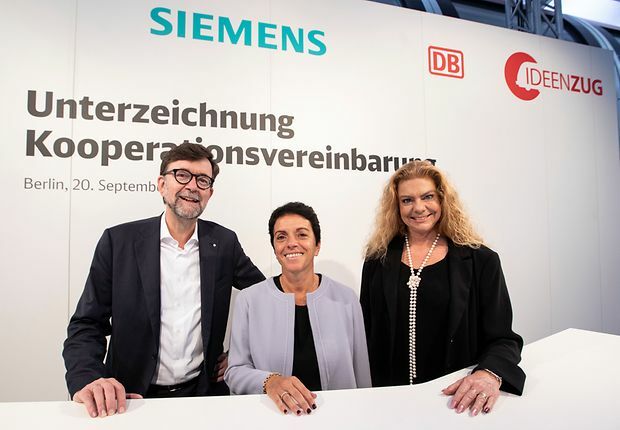 Deutsche Bahn and Siemens Mobility entered into an agreement to collaborate on the DB Regio Ideas Train today at InnoTrans, the leading trade fair for rail and transport technology. Dr Sabina Jeschke, Member of the Management Board of DB for Digitalisation and Technology, Dr Jörg Sandvoß, Chairman of the Management Board of DB Regio AG, and Sabrina Soussan, Chief Executive Officer (CEO) of Siemens Mobility signed the agreement in Berlin. The Ideas Train allows visitors to InnoTrans, the world's largest trade fair for rail transport technology, to experience the future of regional travel. The life-size model of a double-decker coach is divided into different zones, and digital technologies allow visitors to see and feel innovations in interior design and experience unique travel hands on. Zones on the Ideas Train range from sports and premium work compartments to public viewing areas and relaxation compartments. Passengers can take in the latest news on different screens. The agreement signed today makes the Ideas Train available as a platform for partners in the vehicle industry to test components and prototypes. Siemens Mobility is the first system manufacturer to sign up. The partnership aims to merge components from the two companies and develop the Ideas Train platform to create a travel experience with digital features that is designed to meet the target group's needs. From left to right: Dr Jörg Sandvoß, Chairman of the Management Board of DB Regio, Sabrina Soussan, Chief Executive Officer (CEO) of Siemens Mobility AG and Dr Sabina Jeschke, Member of the Management Board of DB for Digitalisation and Technology. "With the Ideas Train we are making a substantial contribution in the research and development of vehicles for the passenger transport of the future," says Jeschke. "We are delighted to have Siemens as a strong partner who can accompany us in driving and implementing new technology and innovations." According to Soussan, "Ongoing digitalisation has meant that customers' needs are undergoing a dramatic change, and they are changing at an increasingly rapid pace. The Ideas Train gives us the chance to work with DB to develop and test technologies for a better, integrated passenger experience. We will also be using MindSphere, the cloud-based open internet-of-things operating system, from Siemens." "We want to work with our partners to develop new strategies for equipping regional trains," says Sandvoß. "The Ideas Train should show local transport authorities what is possible and convince them to think about innovations like these early on, during the tender stage." Siemens has already installed the first prototypes in the Ideas Train. One of these prototypes is an active noise cancelling system in the power napping module. It reduces noise from wind, air handling system, bogies so that passengers arrive at their destination well rested. The Israeli company Silentium is providing support to Siemens for this system. Passengers who want to stay informed and be entertained can try out the smart seat, which was built in collaboration with the Polish company TAPS. The seat offers a number of digital services. Passengers can buy tickets and check in on an integrated touchscreen. They can also order food and drinks from the on-board restaurant, listen to music and watch films. Passengers can customise the seat position and save the settings in the cloud using Siemens MindSphere. If they transfer trains and log in, their seat moves to the saved position and their film picks up where it left off. Current information on the connection is also displayed. The result is seamless, personalised travel. Siemens has made the existing closed circuit television system (CCTV) smarter (iCCTV). The availability of seats, wheelchair spaces and pushchair spaces can be monitored and displayed to passengers and train attendants on the train and can be integrated into apps, such as DB Navigator. Photos of today's event will be available and can be downloaded directly from DB's media portal at mediaportal.deutschebahn.com.